It is her second picture book, translated into Slovenian and presented in our theatre after Scritch Scratch Scraww Plop! Jack and Jim is above all a performance about friendship, demanding of the youngest viewers some answers to extremely significant questions about coexistence and acceptance of others. Is everything that looks different, really so different from ourselves? 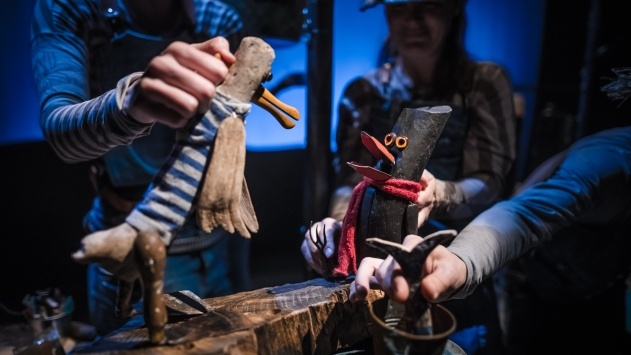 The starting point for the world of puppets in this performance is the marine deposits, discovered by the versatile British author Kirsty Elson. The artist is inspired by some ordinary finds along the Cornwall Coast in South West England, which she turns into highly artistic decorative objects. A variety of colours and textures are an important segment of her creation, dominated by various pieces of wood, podded by the sea and faded by the sun with coloured layers. Ivana Djilas has been directing in many professional theatres and theatre groups; in recent years she has been intensively devoting herself to performances for children and young people. In the previous two theatre seasons she has thus put on the stage of the Ljubljana Puppet Theatre such performances as Goose the Bear and Scritch Scratch Scraww Plop! Cast: Asja Kahrimanović Babnik, Martina Maurič Lazar, Blaž Celarec a. g.